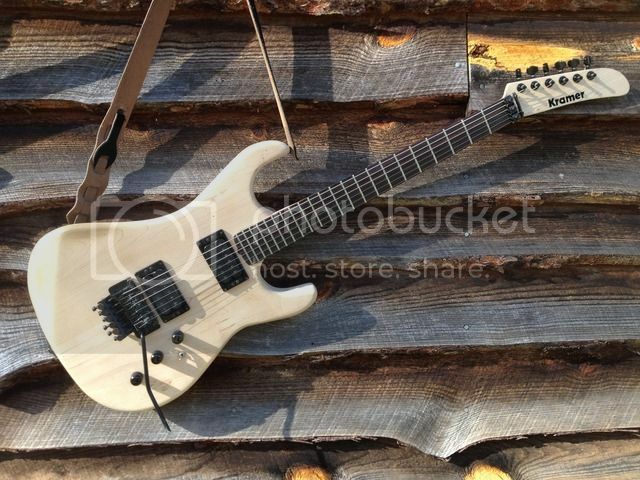 As I was a teenager in the 80’s , I had to add a sweet metal guitar to my collection. What do you have? This is my 1990 Jackson Soloist “Don’t Smoke” graphic. Ooooh, is that the one with the cross cutting feature for harder to tape together scraps? Does that one have the haunting mids everyone is clamouring for these days? 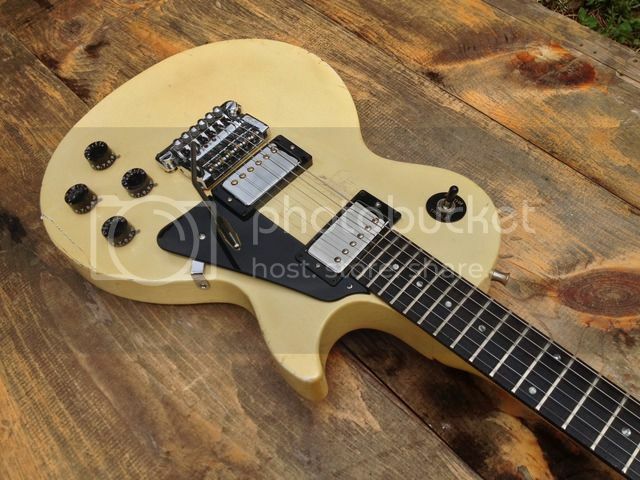 That's the Fawn Hall signature model, isn't it? So far, and not surprising , no Gretsch guitars mentioned in this thread and it IS a Gretsch guitar website after all. This is the “other” guitar section. I like all kinds of guitars...of course Gretsch are my favorites. Okay....I suppose in lieu of a website for shredding/noise, the "Other Guitars" category for guitars here on the Gretsch website could qualify very loosely for this subject, but still only for me, as stretching the limits of the intent (as I understand it) of having an "Other Guitars" category at all. You mean this section was meant for “other” guitars but not all other guitars? 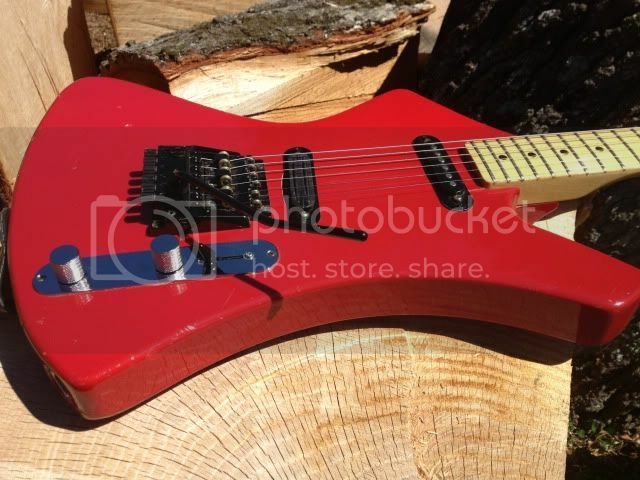 By the way... if you’ve actually had a chance to play some of these metal guitars ... their construction can be very innovative and unique. Many of them are made with high quality materials and components. For me they also represent a certain time in my life. I know we’re all here because we love Gretsch guitars but for many of us we love guitars and other guitar related equipment in general. Variety is the spice of life...or so the old saying goes. I hear the crotchety ol' bastid yelling at us to get off his lawn (I'm funnin' ya, Dave), but I think it's an interesting topic. It helps capture information about the various routes members have taken to Gretschdom, and to dispel the erroneous notion that the only people with legitimate Gretsch interest are old men (and young old men) who fingerpick and rockabillians who have never done anything but practice the (slightly cleaner) 50s-early60s equivalent of shredding. We all came from somewhere, we've all evolved, most of us have many and various musical interests - and none of us permanently escape the influence either of the music which first captured our attention, or the music of our late adolescence and early adulthood, when we were "coming of age" and first getting real playing experience. It's a wide Gretsch world. In the late 70s and early 80s there was an unusual confluence of punk, back-to-basics rock & roll, and an evolution of classic rock guitar heroism. Some guys came down more on the side of (sometimes primitive) simplicity - but some used the newly rootsified platform to adapt the habits of stunt guitar to the earlier idioms. Brian Setzer makes a great case in point, because he has played both sides of the roots/rock shredding divide, and sometimes merged them. Likewise Horton Heat and Unknown Hinson, who are plenty country and roots-rocky enough - but who also know their way around the conventions of shredders. So while the original poster wasn't, I think, asking us to discuss Gretsch guitars as shred axes - he wants to see what we might have been playing in the 80s and 90s - Gretsch does have genuine shredding bonafides. Hidebound nothing-else-counts fingerpickers fall down ga-ga over guys like Lenny Breau, Jerry Reed, Roy Clark, Joe Maphis and Larry Collins - who are all technical speed demons by any measure. That too is shredding - it just isn't "distorted." Here's a good'un. The first time I heard Chettian fingerpicking in person was when I met a young kid who was starting part-time at the music store where I was working in the 80s. He brought in his 60s Country Gent, a gift from his grandfather, who had taught him to play Chet from the time he was knee-high to a Bigsby. Not only had the kid been steeped in Chet, and played the style from childhood, but he had long articulate spidery fingers, a flood of natural talent, and musical soul dripping out of every note. He was about 18-19 when I met him, and when he played a few Chet songs on that guitar that completely changed my notion of what great guitar playing really was. Not just that he was playing that contrapuntal, complex music "competently," but that it was refined and expressive all at the same time. He would have been taken as a prodigy at the Chet convention. What did he think? He thought that Chet stuff was all very well and good, and he wasn't getting rid of that guitar. But it was the 80s, he was a young guy, he was letting his hair grow a bit longer than the family really approved of, and he wanted to play metal. He wanted to shred. He quickly developed that ability, too, becoming a local monster of metal. He found many of his Chet skills transferable. Fast 2-part lead lines with countermotion amazed the natives. What am I saying? It's all guitar, and the boundaries are more fluid and permeable than we sometimes think. 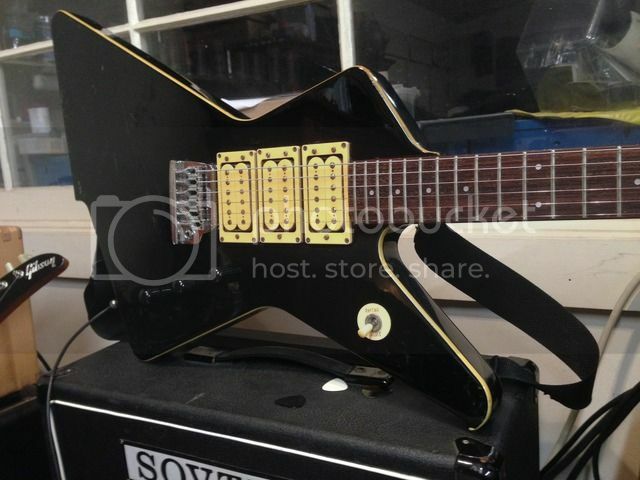 The Corsairs were intended as SLM's competition for Ibanez and Jackson/Charvel - a SuperStrattish body shape, thin flat profile 24-fret neck, a locking trem developed inhouse (to avoid paying royalties to Floyd Rose or Kahler), and Tom's own Magnaflux unbalanced-coil pickups in the 2-1-2 configuration Westone had brought to market several years earlier (I think before Ibanez did it). The build in Korea was certainly more than competent, but the finish work could be a bit industrial, and there was something about the look and feel that just wasn't as evolved and refined as Matsumoku's work had been. But the guitars were OK, and priced right. Then there were some seconds, a few with cracked (but perfectly glue-able) headstocks (which had a very thin profile), some with goofy paint flaws or damage. SLM offered them at steep discount; I bought a couple for the store. A customer came in who worked at the local shoe factory as a leather buyer; he made plush custom straps for the local market. He saw the guitar with the broken headstock, which I had glued, and suggested covering it with snakeskin. Snaker guitars were sent to Lancaster, OH for the leather guy to cover. Some guitars just got the tops covered, others were wrapped around the whole body. The guy really was good at the work, and they looked killer. The guitars made their debut at the 1988 Summer NAMM that year in New Orleans. Models were hired to slink around the SLM booth showing off the guitars. Dealers liked them, and the production run was sold out. A few weeks or months later, the now-predictable snake-lovers' reaction began. How dare someone slaughter innocent snakes to wrap their skin around guitars for metalheads! SLM was never a really bold or adventuresome company; run by a conservative family in the midwest, it quickly retreated from what must have seemed to the owners a public relations embarrassment. Also, Tom had been working on a sweepable midrange notch circuit which filtered out frequencies above and below the center frequency, with steep falloff on either side, ranging from the low to the high mids. The idea was to leave midrange bands sounding boosted (because others were scooped). The circuit wasn't done, and it wasn't well suited to the pickups. It does sound...interesting. Especially with a lot of gain. So I guess I have sort of a prototype, but of course no one cares. I was actually a little too old to shred authentically in the Age of Hair Metal, but copped enough of the techniques to demo guitars and gear. It wasn't so much my personal thing, though. I had followed the evolution of rocknroll guitar from the Beatles through psychedelia and Brit blues-rock and hard rock and prog and proto-metal. But by the 80s, when Van Halen's revival had turned into ... well, we remember guitar in the 80s ... my interest had shifted to fusions of various sorts. Guys like Holdsworth and Steve Morse crossed all the boundaries, and I liked (and like) Steve Vai (though not always the contexts he plays in). But it wasn't something that was ever going to come from the center of my guitar soul - and I'm just too clumsy of execution to convincingly shred. 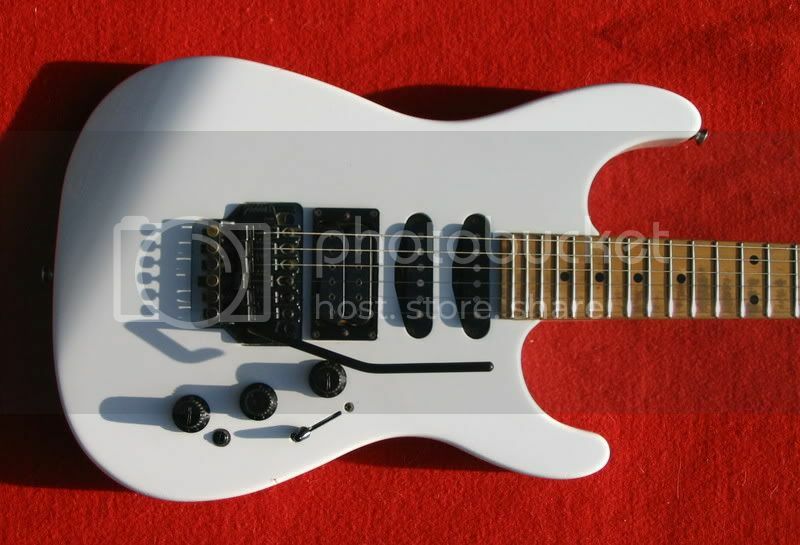 Charvel Model 4. Still have it but haven’t touched it in many years. Setzer...nice collection! 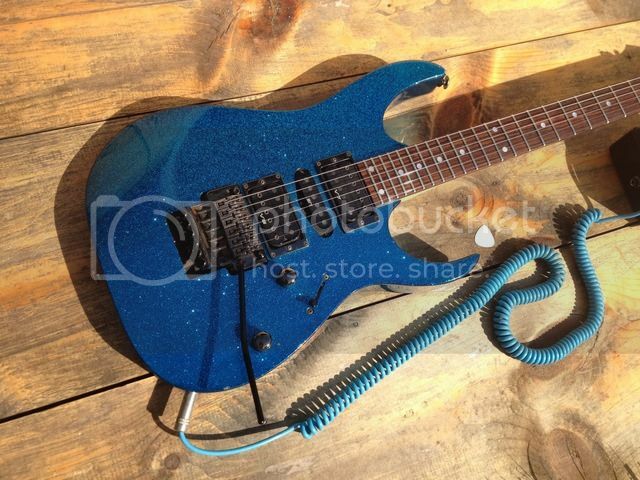 I have a Washburn too, an A15...the guitarist in my high school band played one! 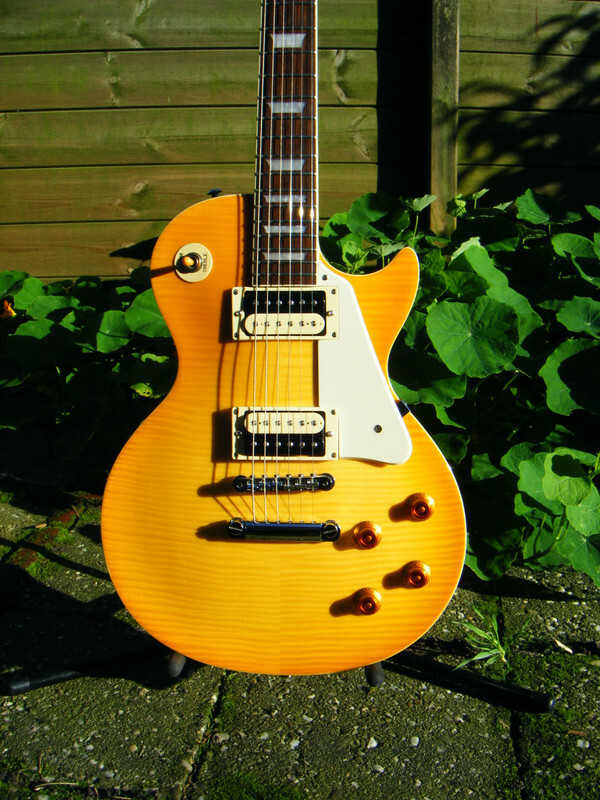 I use my Lemon Burst Tokai Love Rock for all the heavy stuff. I'm not that much of a lead player to justify myself a guitar with a Floyd. The weird pointy guitars that I have now were "hey I wish I had these back then", and I just haven't been ready to cut them loose yet. I don't play them much - they don't even fit with the stuff I'm doing now functionality wise (those floyd roses are pretty sterile IMO) but they're fun to fool around with.